Starting Monday, Elizabeth O'Neil and Farley Jones will be on their way to the Orient. So will Anne Smith and George Edwards and three other American couples. But Expo 70 in Tokyo will be only incidental to their plans. So will a visit to Mt. Fujiyama and the beautiful Japanese gardens. They're headed for Seoul to be married in a simple ceremony with 698 other couples. In what is believed to be the biggest mass marriage ceremony ever held, the young couples will be joined by couples from Japan, Korea, England, Germany, France and Austria. It's all part of their religion. There are of course no objections to have a conventional ceremony here in the States or in the countries they hail from. But getting married in one of the mass ceremonies serves to illustrate a basic tenet of their faith. The Washington couples are from a community known as the Unified Family, whose national headquarters are at 1611 Upshur St. NW. This, in turn, is part of the international Unification Church, whose headquarters are in Seoul. 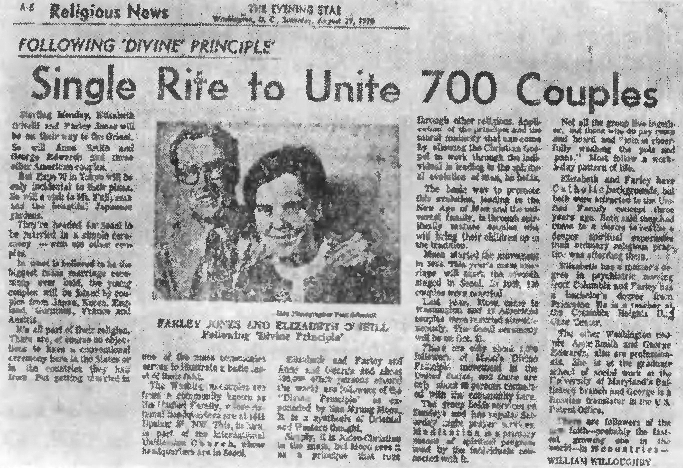 Elizabeth and Farley and Anne and George and George and about 400,000 other persons around the world are followers of the 'Divine Principle' as expounded by Sun Myung Moon. It is a synthesis of Oriental and western thought. Simply, it is Judeo-Christian in the main, but Moon sees it as a principle that runs through other religions. Application of the principle and the moral maturity that can come by allowing the Christian Gospel to work through the individual is leading to the spiritual evolution of man, he holds. The basic way to promote this evolution, leading to the New Age of Man and the universal family, is through spiritually mature couples who will bring their children up in the tradition. Moon started the movement in 1954. This year's mass marriage will mark the seventh staged in Seoul. In 1968, 430 couples were married. List year, Moon came to Washington and 13 American couples were married simultaneously. The Seoul ceremony will be on Oct. 21. There are only about 1,000 followers of Moon's Divine Principle movement in the United States, and there are only about 50 persons connected with the community here. The group holds services on Sundays and has regular Saturday night prayer services. Meditation is a primary means of spiritual progress used by the individuals connected with it. Not all the group live together but those who do pay room and board and -join in cheerfully washing the pots and pans". Most follow a work-a-day pattern of life. Elizabeth and Farley have Catholic backgrounds, but both were attracted to the Unified Family concept years ago. Both said they had come to a desire to realize a deeper spiritual experience than ordinary religious practice was affording them. Elizabeth has a master's degree in psychiatric nursing from Columbia and Farley has a bachelor's degree from Princeton. He is a teacher at the Columbia Heights Day Care Center. The other Washington couple Anne Smith and George Edwards also are professionals. She is at the graduate school of social work at the University of Maryland's Baltimore branch and George is a Russian translator in the U. S. Patent Office. There are followers of the new Faith -- probably the fastest growing one in the world -- in 20 countries.